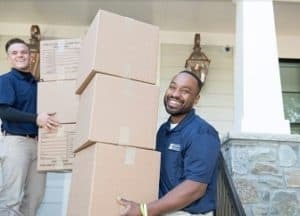 The experience of moving to a new home can be both challenging and rewarding, and the experience is only improved by hiring the right Washington DC movers. It’s important to keep in mind before you hire anyone that you’re entrusting your most valuable belongings to whichever movers in Washington DC you choose. That means you want to be able to rely on the movers to help you prepare and make a smooth transition. At Suburban Solutions, we pride ourselves on our years of experience assisting customers throughout Washington DC and the surrounding areas. If you’re planning a move and need professional insight to have the most seamless experience possible, give us a call at 1-888-SUB-SOLV. We have the tools and training to make your move as fast and hassle-free as possible. Just as you wouldn’t hire a babysitter or cleaning service without research or recommendations, you should be sure you know what you’re looking for when you book moving services. Above all, you want the movers that you choose to prioritize cost-effectiveness, safety, and quality. What are the traits you should look for to ensure your moving company puts these first? Licensed, bonded, and insured. It should be foremost on your list of priorities to find a moving company that is properly licensed and insured. It’s easy to fall into a scam if you don’t take these requirements into consideration. To have the safest possible transition to your new home, make sure the Washington DC movers you choose are fully bonded, licensed, and insured. Affordable. While you want a proper balance of cost and quality, it can help to compare prices between local moving companies who offer similar services. The prices they quote may not be all-inclusive, so be sure to ask what is included with each estimate. After doing some research, you may be able to get an excellent rate with reputable Washington DC movers. Experienced. Years of experience and specialized training can make an enormous difference when comparing movers Washington DC offers. The stress of moving can be lessened when you entrust your valuables with the right movers. At Suburban Solutions, our team is adept at problem solving and maintaining a positive attitude. Our depth of experience allows us to perform even the most difficult tasks with care. We understand the importance of working efficiently in order to complete a move as quickly as possible without sacrificing our commitment to service. Reliable. When you hire a moving company, you expect to show up in the right place at the right time. Otherwise, it can wreak havoc with all of your plans. Make sure the movers you hire have positive reviews from previous customers. Suburban Solutions is a full service moving company. We work diligently on behalf of our customers so that their moving experience is as stress-free as possible. When you’re looking for Washington DC movers who prioritize safety, speed, and service, give us a call at 1-888-SUB-SOLV and find out how we can help you.